I'd like to thank our guest author, Amy L. Peterson, for providing today's post. You all know that I am a big animal lover. Today, Amy is talking about her book - Something Furry Underfoot. If you're an animal lover, this book is right up your alley. The following is a guest post by Amy L. Peterson. Something Furry Underfoot is my humorous, touching memoir about raising a whole bunch of pets my husband kept bringing home, few of which I knew anything about. Take hedgehogs: I didn't know they prefer to sleep away the day and play at night, but I learned this when our male hedgehog, Louie, escaped from his cage, and I found myself spending three evenings in the dark on our living room floor waiting for Louie to show. I also didn't know what I later included in the book as Tip: 8: Love always finds a way. Because, the fourth time Louie escaped, we found him in our female hedgehog’s cage. The first litter of babies arrived 28 days later. 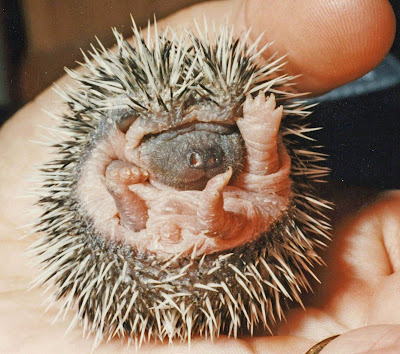 8 day old baby hedgehog. I also knew nothing about ferrets before Mark got one . . . then another, then another. The cool thing was that each ferret was as different as the one before. Sox had an obsession for Beanie Babies and would take one after another off our shelf and hide them in a secret location (behind our couch, for example,) called a stash pile. Big Wuzzy liked to hide behind chairs and run out and tackle us. Rocky was a devilish little fellow whose love of dirt caused us to cover all of our plants with plastic covers. Chunky was a sweet little fella that cost us $1,200 in vet bills and loved tiny bits of bagels with butter. 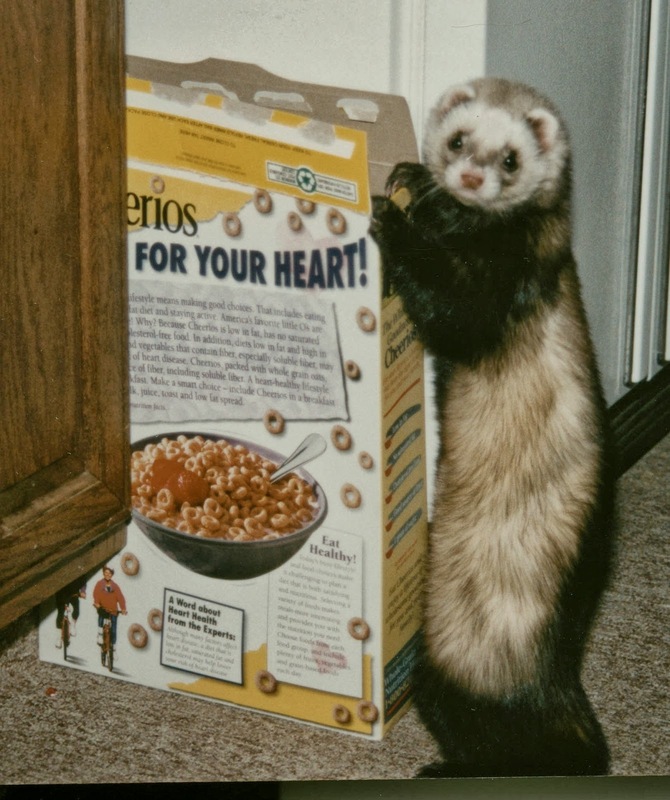 Big Wuzzy getting some Cheerios. I suppose the pet that surprised me the most was the domestic duckling a co-worker found wandering in a suburban front yard. We named her Bumpkin and we raised her inside our house with two dogs and a cat. Bumpkin loved sunflower shoots that sprouted under our deck, and she ate the dogs’ food in addition to her duck food. You can see more about Bumpkin by going to amylpeterson.com and clicking on Videos. Mark having a tender moment with Bumpkin. 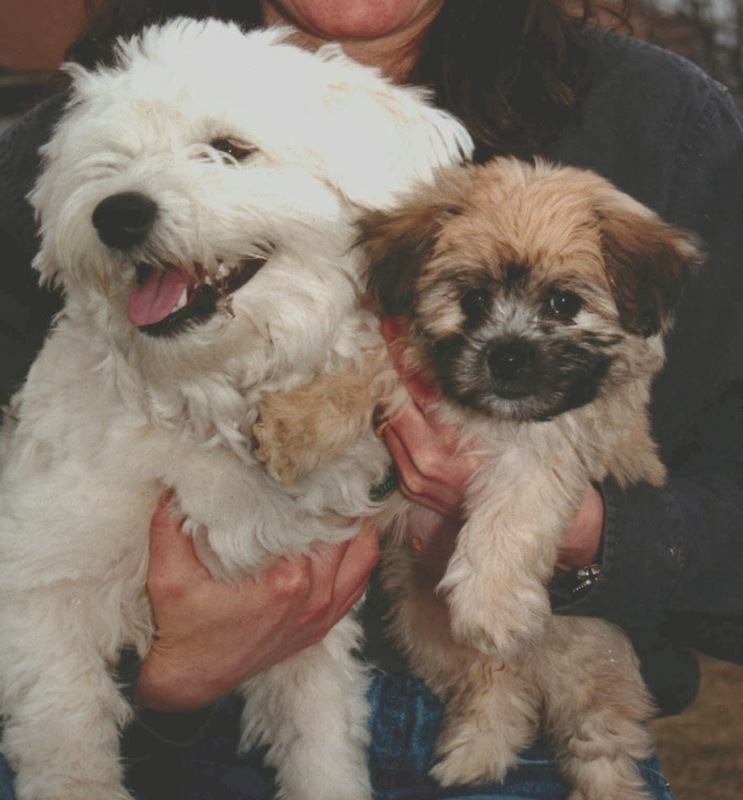 The one pet I did have growing up was a puppy--a beagle followed by a cocker spaniel. But even with two puppies under my belt, I never knew the endless energy of a puppy until we got Dusty. Mark found Dusty at a pet store, digging furiously at the side of his cage “as if to get my attention,” said Mark. Dusty was a fun-loving puppy that had more energy than Mark and me put together. Our answer was another puppy we named Little Dipper. Of course, Little Dipper preferred long walks with me to playing with Dusty. Go figure. Something Furry Underfoot includes the pets that shaped my life over the course of 18 years: two hedgehogs and several litters of baby hedgehogs; eight ferrets, two dogs; one stray cat; rescue rabbits; a domestic duckling; endless numbers of hamsters, mice and gerbils; two guinea pigs; two mynah birds and several tanks of tropical fish. Yes, remember Tip #4 8: Even fish can be stressful. At least in my house. You can follow Amy on Twitter - @amylpetersonblg. If you're interested in purchasing Something Furry Underfoot, it's available as a paperback as well as an ebook. Amy is also offering one lucky US resident a signed copy of Something Furry Underfoot. To enter the giveaway, just click here and you will be directed to the Rafflecopter widget. Good luck! Have a fabulous Friday and don't include us in the give-away as we are across the ponf. No worries Molly, hope you have an excellent day! Wow that's pretty cool that he was potty trained! May dad had ferrets as he was a puppy :o) I saw two hedgehogs some days ago in my back yard, they did unspeakable things.... Have a great friday and thanks for a super post! Hmmm sounds suspicious Easy... Keep an eye on those hedgies! Sounds like a great book, Miss Ann! A wonderful guest post...thank you for sharing with us. That little critter is so very cute, cute, cute! Dusty and Little Dipper are so cute! oh MY! Baby hedgehogs! ANd our momma has a love affair with ferrets - like @SnotfaceCritter!! FaRADAY: See Allie? Having two bratty brothers is NOTHING. MOL! What a cutie. Bless you for taking him in and trying your best. People like you make the world a better place. Wow!!! she is one busy person. I'd love to read the book... I can tell it'll be something funny. Ann, what a super cute web site! Thanks for a wonderful post. It looks great! I appreciate it so much! And by the way, I've mailed many a book over the big ponds--to Nigeria, Ireland, the UK, Canada, Mexico--so international readers should feel free to enter the contest. In fact, my book has traveled more than I have. Doesn't seem quite fair, really. Sounds like a very interesting and fun experience to live with so many different types of animals. Also, the picture of the baby hedgehog is adorable! That sounds like a great book by Amy. We had lots of pets (dogs, cats, rabbits, guinea pigs, hamsters, lizards and fish) growing up, too -- but never ferrets, hedgehogs, mynahs or ducklings. Oh wow - you guys have a pretty long list there too! Sounds like a great book. My grandchildren would love it. We have 4 dogs, all of them Boston Terriers. They range in age from 7 years to 14 years.